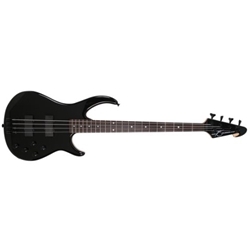 Peavey Millennium bass guitars are well regarded as the essential working player's bass for their solid low end, playability and craftsmanship--in fact, pros such as John Campbell (Lamb of God), Josh Sattler (doubleDRIVE) and Marco Mendoza (Ted Nugent, Whitesnake) are avid Millennium players. Each Millennium AC bass features a solid Basswood body, hard rock maple neck with rosewood fretboard and an attractive quilted maple cap. An active electronic system, driven by Peavey CirrusTM neck and bridge active pickups, provides an extra boost in volume and tone with more expressive sound control. These 21-fret, 34 inch scale basses also feature volume, pickup blend, bass, mid and treble controls, as well as the new Peavey headstock design. The studio quality active 18 volt electronics accurately reproduce even the most nuanced performance.